Our grounds and buildings are available only to non-profit organizations for special events, meetings, and workshops. 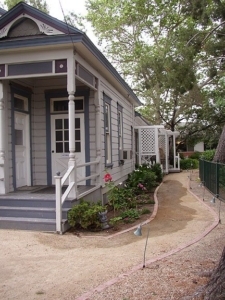 Unity of Tustin offers small to mid-sized rooms in a beautiful, sacred setting. Our lush Meditation Gardens, labyrinth, and water features provide the perfect retreat from the busyness of the world. Immerse yourself in our inviting and refreshing atmosphere for daytime or evening, indoor or outdoor events. We provide an intimate and sacred environment, and at the same time, many of the same amenities that could be expected at a large hotel or convention hall. The following information is provided to help you discern if our facilities will be a match with your needs. Please call Karen Knee, at (714) 730-6392, or email her if you have questions or would like pricing information. Our sanctuary is the largest building on our campus. It seats 225 people and is equipped with full audio/visual capabilities. Bottled water only is permitted in the sanctuary. No food or other beverages. Victoria House is 80-plus years old. The living room comfortably seats 20 in a circle and up to 40 if the seats are in rows. It is the perfect setting for meetings, support groups, and classes that do not require a lot of audio/visual. There is no audio/visual capabilities installed in this room; however some portable equipment is available. There is a piano available for use. While use of the kitchen in Victoria House is permitted, do not use the dishwasher or garbage disposal – our plumbing is fragile! All leftover food should go in the trash. Please provide all paper products and condiments. Use of the grounds on an exclusive basis is available for an additional charge. Smaller classrooms in Victoria House and in our education building offer a variety of sacred settings for your gathering. The rooms vary in size from seating 15 to 40. There is no audio/visual equipment in these rooms. We have an outdoor Chartres-style labyrinth that is open to the public seven days a week from 7 a.m. to 9 p.m. All are welcome to walk the labyrinth. We recommend if you have a group and/or would like a facilitator that you schedule your walk. We encourage love offering donations for those who walk the labyrinth. We are happy to rent to support groups. For 18 years we have made a commitment to be a place of healing and transformation. The recovery process that is facilitated in these meetings is a valuable aspect of healing for many.